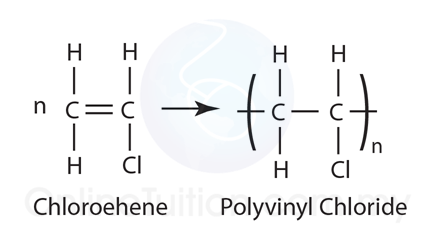 Polymer is a large molecule that is in the form of a long chain with a high relative molecular mass (RMM). 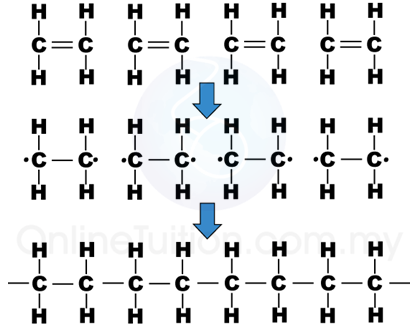 It is made up of many smaller units called monomers, which are joined together through a process called polymerisation. 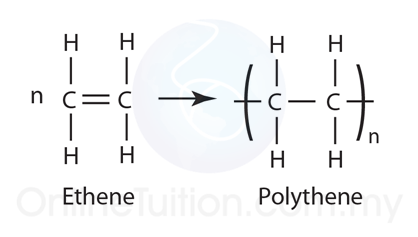 Thus the monomer is actually the repetitive unit of a long polymer chain. Natural polymers are made up of carbon, hydrogen, nitrogen and oxygen. 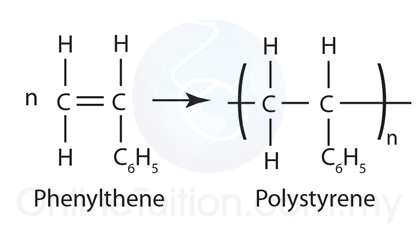 Synthetic polymer is a polymer that is manufactured in industry from chemical substances through the polymerisation process. 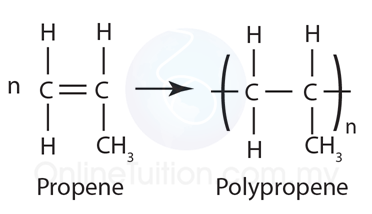 Polymerisation is the process of joining together the large number of monomers to form a polymer. 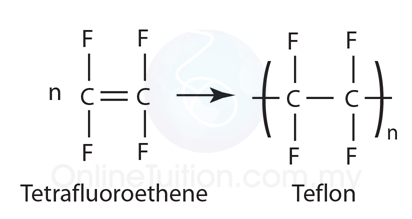 Polymerisation by addition involves monomers with >C = C< bonding, where the monomers join together to make a long chain without losing any simple molecules from it. 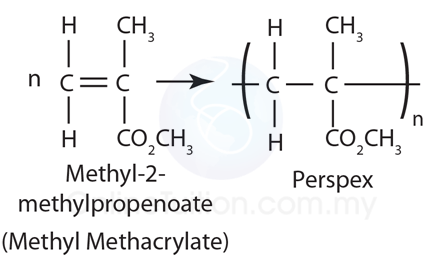 Polymerisation by condensation involves the elimination of small molecules like water, methanol, ammonia or hydrogen chloride during the process. 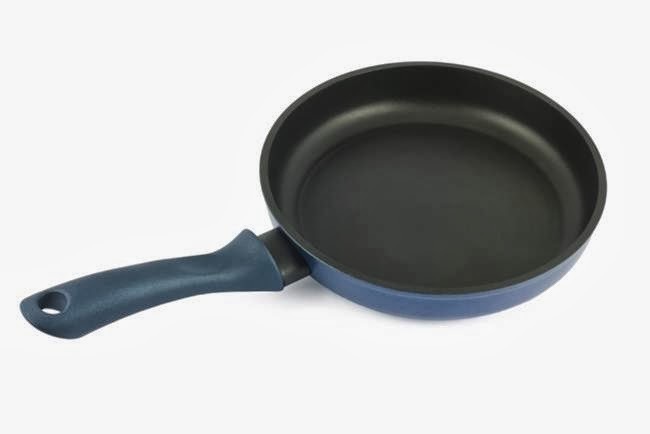 Examples of products of this process are terylene and nylon-66. Plastics are light, strong and do not react with any chemical substances, like acids and alkalis. They can be made into many shapes and sizes. They are also good insulators of heat and electricity. 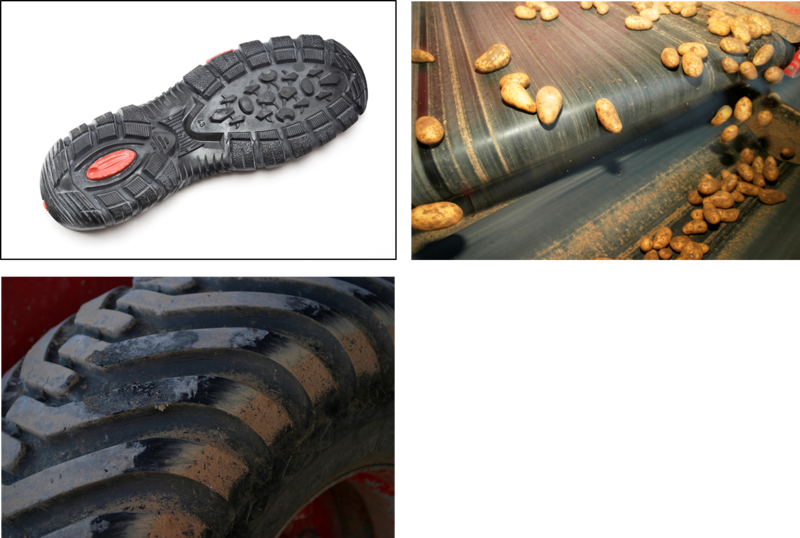 Examples of synthetic rubber are neoprene and styrene-butadiene(SBR). Uses: to make rubber gloves and to insulate electric wires. Uses: to make tyres, soles of shoes and mechanical belts. 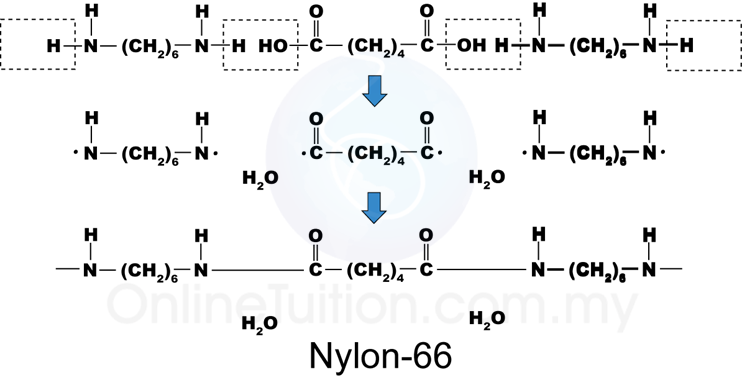 Nylon and terylene are synthetic fibres which undergo the condensation polymerisation process. These fibres resemble natural fibres but more resistant to stress and chemicals, and more long-lasting. In both cases, water is eliminated during the polymerisation process. 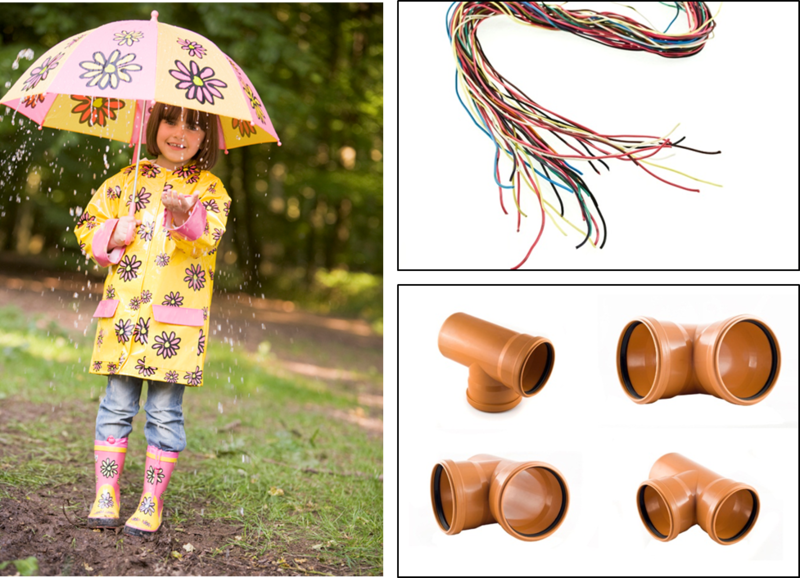 Uses: To make umbrellas, carpets, comb, curtains, nylon string and rope, socks, toothbrush and so on. Uses: To make fishing nets, clothes (quick-dry, non-iron), cassette and video tapes. Synthetic polymers are also used to replace natural polymers such as cotton, silk and rubber. 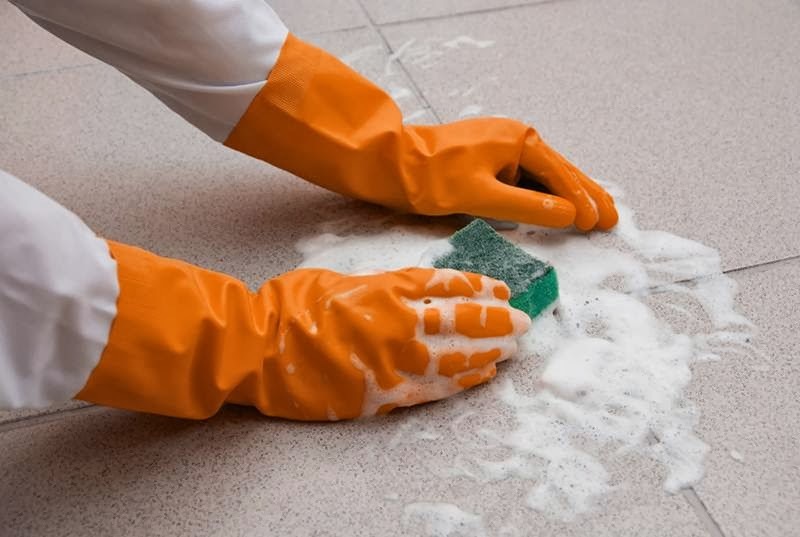 However, synthetic polymers cause environmental pollution. Most polymers are not biodegradable . Disposal of polymers has resulted in environmental. The open burning of plastics gives rise to poisonous and acidic gases like carbon monoxide, hydrogen chloride and hydrogen cyanide. These are harmful to the environment as they cause acid rain. Burning of plastics can also produce carbon dioxide, too much of this gas in the atmosphere leads to the `greenhouse effect’. Recycling polymers: Plastics can be decomposed by heating them without oxygen at 700°C. This process is called pyrolysis. 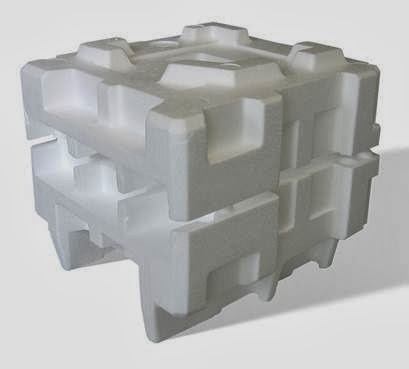 The products of this process are then recycled into new products. Inventing biodegradable polymers: Such polymers should be mixed with substances that can be decomposed by bacteria (to become biodegradable) or light (to become photodegradable).